As parents, we are responsible for the environment in which we raise our children — emotionally, physically, psychologically, socially and spiritually. That responsibility is enormous. All the years our children are home before spreading their wings and beginning the next chapters of their lives, they are listening to us, watching us, and soaking it all in. We simply must strive to do everything possible to get it right, and nothing is as important for a child’s emotional and physical well-being as is good health . . . and the eating (and exercise) habits that contribute to it. The number of children and teens who are overweight and obese is frightening, and the percentage of those who take prescription meds for chronic diseases has jumped dramatically. Pediatricians are increasingly issuing prescriptions for high cholesterol, high blood pressure and hypertension, and more kids are now being treated with drugs for diabetes, sugar maintenance and insulin resistance. It’s a fact, too, that most of the increases in drugs for diabetes is seen in overweight and obese girls, a factor in more of them having erratic menstrual cycles, leading to hormonal disturbances, more diagnoses of PCOS, which itself leads to a whole slew of medical issues, including infertility problems. On top of all this are the emotional ramifications of obesity, confirmed by the increase in prescription drugs for depression among overweight and obese girls. And the American Liver Foundation says that about 5% of obese children have non-alcoholic fatty liver disease, caused by too much body fat, especially belly fat. With few exceptions, overweight kids have overweight parents—and overweight parents are frequently in denial about their child’s weight. Either they refuse to acknowledge it, or rationalize the extent of it, or think their child will slim down as they grow up. Overweight parents also need to understand that their own large size is NOT OK with their children. Slim kids don’t like having overweight parents. They are embarrassed by it. They also feel insecure because overweight parents have greater health risks, and are less active in their kids’ lives. Overweight kids don’t like having overweight parents either. With no role model, they feel inhibited to speak to an overweight parent about how they feel about their own weight and size. They can’t ask for proper lifestyle guidance because they don’t believe their parents can help them. Will your child be happy growing up overweight like you? Will your child be healthy? 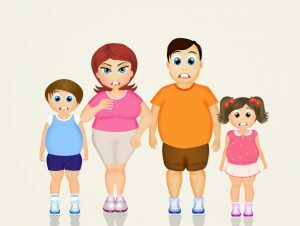 Will your child grow into the overweight teen and obese adult who blames you for the food and weight issues that will undoubtedly be a lifelong battle for them? You are responsible for grocery shopping, for cooking and preparing meals, for the eating habits that will be cultivated in your children. If you are an overweight parent, it’s time to begin the journey to a healthier, slimmer life, and to do so in a manner that resembles the way you, and your child, can eat for the rest of your lives.